To make this Mickey cake, first I made a 1 kg round shape cake and, I cut Micky's ears from another materiel because that cake was not enough for the ears. After I applied different colors and made it very nice. I hope you like this Mickey cake. 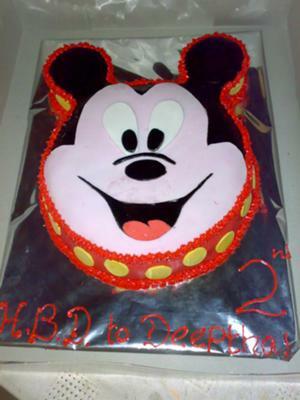 Editors Note: This Mickey cake looks great. I like how you decorated the sides of the cake with the dots! It adds a nice touch to make it look more festive and colorful. Great job with the cake and thanks for sharing it with us!